Standing on the eastern end of 14th Street at Avenue C, there's nowhere to go that makes sense but back where I came from. 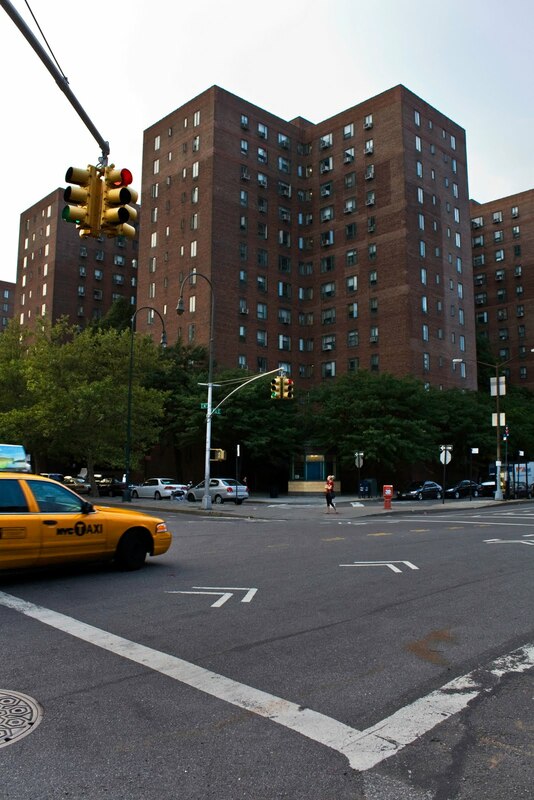 Across the street is a view.of a corner of Stuyvesant Town, looking like any other housing project. There are 35 of these buildings, containing 8,757 apartments, making this development much larger than an Illinois town I once lived in with a population of 7,000. That was a grim two years of my life, and I imagine living here would be equally grim. For me, anyway. I know it has its fans. Please enlarge the map below to get an idea of how truly huge it is. You have to click the View Larger Map link and then click the plus sign a few times. I know it's a few steps more than you want to take, but believe me, it's worth it. I'm getting pretty tired of this building. It's not the prettiest thing I've ever seen. I hope you're doing well, Mary. You haven't posted in such a long time. The people demand more photoblogging! I just saw a tumbleweed roll across your webpage.....hope you are well. Thanks everybody. I'm well and will be back soon. I'm missing this! Alarko Kombi Servis olarak verdiğiniz bilgilerden dolayı teşekkür ederiz. Çalışmalarınızın devamını dileriz. "Everything is very open with a precise clarification of the issues.